Every day up to 50 campers are out of camp on optional day and overnight trips. 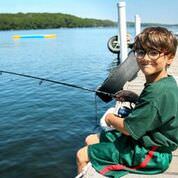 Every camper is given multiple opportunities daily to go on camping trips and day excursions. But, the choice is the camper’s. Cabin Overnight Camping: Each cabin gets a chance to camp overnight on our oceanside campsite have and lobster/steak cookout followed by s’mores. Ocean Power Boat Day Trips: Power boat trips to the islands are offered aboard our 24’ Boston Whaler with 230 horsepower engine. Ocean Sailing Cruising: We offer an optional two and three-day cruises aboard a 38’-40’ yacht. Campers sail among the beautiful islands of Penobscot Bay, visiting harbors along the coast. They also camp on an island and enjoy cookouts of steaks and lobsters. 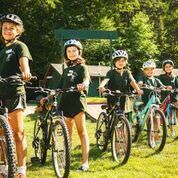 Many consider the cruise the highlight of the camp experience and about 75 percent of our campers participate each summer. Cost for the two-day Ocean Sailing Cruise is an additional $275 and $395 for a three day cruise. Ocean Sailing Day Cruising: Ocean day sailing is offered on our 24’ Pearson Ensign sailboat. Fishing Day Trips: Fishing trips go out by canoe on the Penobscot River and Parker Pond. 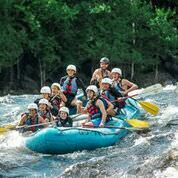 Whitewater Rafting: Whitewater rafting day trips are offered to the Kennebec and Penobscot Rivers. The rafting is very safe and run by professional tour operators. Cost is additional $195. Ocean Kayaking Day Trips: Paddle along the shore of Penobscot Bay and out among the islands. Canoe Day Trips: Campers take canoe trips to mild white water rives nearby. Overnight Camping Trips: Every camper has an opportunity for overnight camping in Acadia National Park or on our oceanside property catered with steak and lobster. Rock Climbing Day Trips: Weekly Rock climbing day trips are offered to beautiful Acadia National Park. Mt. Katahdin Hiking and Camping Trip: A three day trip to Maine’s tallest mountain happens at least twice per summer. Hiking Day Trips: Hiking day trips to Acadia National Park, Blue Hill Mountain, and Holbrook Island Sanctuary are offered weekly. Mountain Biking Trips: Mountain biking trips to Acadia National Park and its islands can be either day trips or overnight camping. Photography Day Trip: Photography trips to local environmental sanctuaries, islands, and Acadia National Park capture the beauty of our area. Blueberry Picking Trips: When the blueberries are ripe, we offer day trips. Whale Watching Excursions: These trips depart from Bar Harbor. Cost is additional $80. 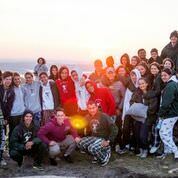 Boston Trip: This three-day trip gives campers a chance to see the city, go shopping, visit famous Fenway Park, enjoy some sightseeing and special meals outside of camp. Cost is additional $425. Lobster Boat Day Trips: Ride aboard a Maine lobster boat off of Mt. Desert Island and Acadia National Park and see how lobsters are caught. 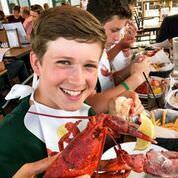 After the boat ride campers get to eat lobster if they dare.